Let's have some luscious lemon bars for today's tea! I'm using another one of my late Great Aunt Kitty's trios that she painted for me. This pansy pattern is perfect for Spring time. My green gingham cloth goes with so many of my patterns. This Lemon Bar recipes comes from my old Betty Crocker Cookbook, that I received back in 1970. I've slightly adapted it, by adding more lemon juice and also some lemon zest. It's really a wonderful recipe and makes a square pan of either and 8x8", or a 9x9". I hope you'll try them soon. Mix thoroughly the flour, butter and powdered sugar. Press evenly into the bottom of an 8x8x2" or 9x9x2" ungreased pan. Bake 20 minutes. Meanwhile, beat remaining ingredients for about 3 minutes until light and fluffy. Pour over the hot crust. Bake about 25 minutes longer or until no imprint remains when touched lightly in center. Cool; cut into squares. Dust with powdered sugar. Hello dear Kitty and a happy Monday to you! How good these lemon bars look - I could do with a few with a cup of tea right now! And your tea cup is just beautiful...so dainty! Kitty, I can't resist lemon bars especially if they're served with pansies! I love that you use and have so many pretty treasures painted by your namesake Aunt too. Your green and white gingham says spring! We love lemon bars around here! Yours look great and I love the tea cup. How sweet to have family treasures such as these. Those sound wonderfully lemony! I am taking your comment about green gingham under advisement. The dishes that your sweet aunt painted are stunning! What beautiful talent! Happy Monday, my friend. Love and hugs! Wow your lemon bars look so yummy! Thanks for sharing the recipe to make them. Have a wonderful spring day! Your lemon bars look delicious, Kitty. I rarely make those and yet I enjoy them. I had a friend who lived in Canada that made lemon bars that would melt in your mouth. Mine never turn out like hers did. She is with the Lord now. You have quite the beautiful collection of treasures on your China collection, Judy beautiful. Oh gracious, look at all those spelling errors!! So sorry. Just beautiful, and in your China collection. My phone spell check goes crazy!! You have the most wonderful selection of teacups!! This one is especially beautiful; I think your great aunt Kitty was very talented with a paint brush! I love pansies in spring and these colors are so pretty. The other thing I LOVE is lemon bars; I confess I love anything and everything with lemon. :-D I have a Betty Crocker cookbook, too, and it's a great reference for all kinds of recipes. This one looks delicious!! Thanks so much for sharing, Kitty, and thank you for all your visits and comments. I'm about to get caught up on visiting after my two-week absence from blogging. Have a wonderful day, my friend! What a lovely set. I do love handpainted china, especially when there are pansies. I do love lemon desserts. I MUST try this one. Thanks for posting it. Your teacup trio is so pretty. Your great aunt was certainly a talented painter. What a special keepsake she made for you. Oh yum! I always enjoy lemony treats with my tea! The handpainted trio sets are beautiful! That is one of our all time favorite recipes...and I can make them with vegan marg when my allergies are bothering me. I love your Aunt's hand painted china. Just beautiful! Thanks for linking to Tuesday Cuppa Tea! I love lemon bars and yours look so yummy! Your cup & saucer are perfect for spring...the pansies are so pretty! You are making such great use of Aunt Kitty's pieces on your blog postings. That is a wonderful way to carry on the tradition. Your Lemon Bars look delightful Kitty! So glad you shared. Your Aunt Kitty did a perfect job on painting your lovely set. I know how proud of it you must be. I had a good look at the china your Aunt Kitty painted and must say she was very talented, the pieces are beautiful. There are lemons in the fridge and your squares could be on the menu tonight! Thanks for sharing another tasty recipe. Kitty, I love the pretty pansies that you Aunt Kitty painted. She was a true artist! The lemon squares remind me of a story of my daughter and my mother-in-law. My mother-in-law made a pan of lemon squares, when my daughter was young and visiting her grandmother. My daughter could not stop eating them and my mother-in-law did not stop her. She was paid back, however, because she had to stay up all night with my daughter who was soooo very sick! When I make your recipe, I promise to eat only one (or two) at a time - lol! Hi, Kitty! I'm so late getting back to you when you sweetly commented on my DIY bird bath, but I've made up for it with visiting all the way back to your Twinky bunny car--what a miss that would've been!!! You can bet I pinned that for the chickadees here!! We will make them soon! And the dishes your aunt painted...what a treasure you have. I adore pansies--my grandmother did too--so that set especially made my little heart very happy! :) It's always so nice to visit your beautiful blog! Your bars look so yummy and so lovely with your china, love the touch of the flower with it! Oh, that china is gorgeous!! What a treasure! She was one talented lady, and how special to have it to remember her by. Lemon bars are a favorite of mine -- lemon and chocolate are neck and neck as my favorite! A cheerful post, with gingham, pansies and lemon! The dishes are really beautifully painted. She was quite the artist. The green checked gingham goes perfectly with your display. I am sure your lemon bars are very tasty. Thank you so much, my sweet friend, for sharing this divine recipe with Roses of Inspiration :) Have a blessed Thursday! Love to you! Your Aunt Kitty was truly an artist! Simply gorgeous dishes. Lemon bars are one of my favorite sweets! Thanks for sharing with SYC. Kitty, how wonderful to have those lovely things from your great aunt! And what better use for such a "trio" (first time I've seen that term, and I like it!) than a lemon bar and a cup of tea! Kitty, I love it when you use pieces your aunt painted...they are beautiful. I envy anyone that is artistic...I can't even draw stick figures! The lemon bar recipe I use is the same one you use...they are delicious little gems, aren't they? Beautiful set! What a talented lady. Lemon bars are sooo good. I've never tried a 'scratch recipe though. Oh your lemon bars look dreamy~ every time I've tried to make them, they're a gooey mess, I will try your recipe asap! Thanks Kitty, and I love your pretty pansy teacup! What a beautiful treasure from your Aunt, the pieces are so soft and delicate. 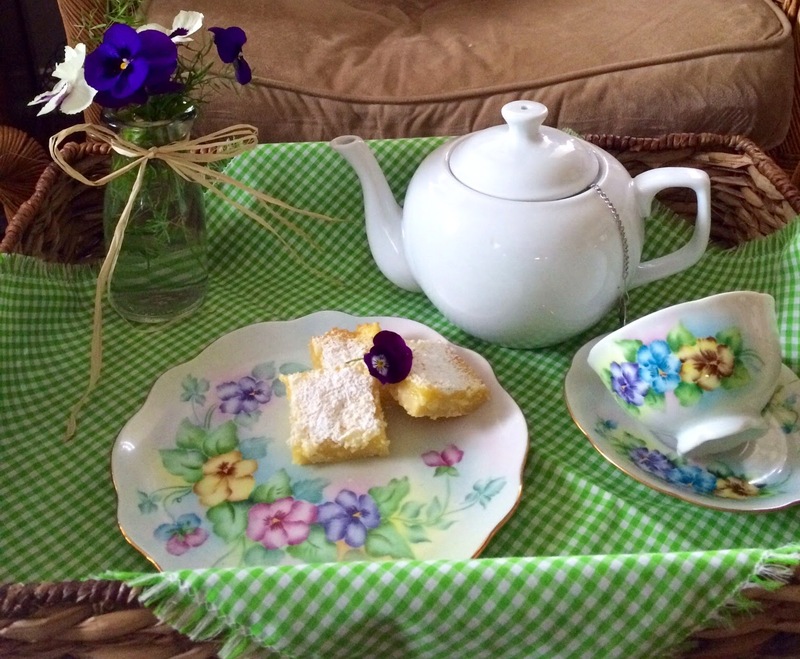 Lemon Bars are perfect for this special tea and they look delicious. Are you'al floating away up there yet, I don't remember when we have had this much rain, it is awesome. Thanks so much for sharing your Lemon Bars and beautiful tea set with Full Plate Thursday and come back soon! What a beautiful teacup trio! I love lemon bars and have made them several times. Delish! My dear sister friend...somewhere, while searching your recipes, I read about you selling your wedding china and wondering if anyone else did things like that.